Oh, the weather outside is frightful, so I found myself reading a magazine called Cook's Country. My friend the jazz singer Peggy Farrell dropped off a bundle on my doorstep and I have been enjoying them. Mostly enjoying them anyway. 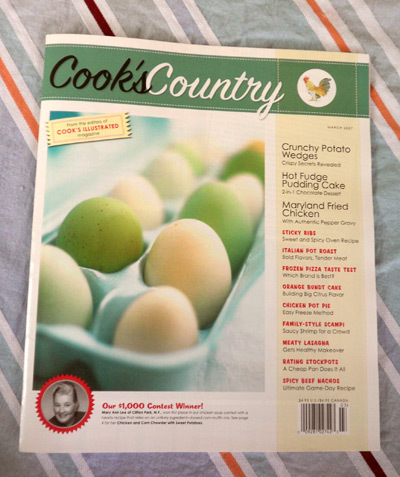 Cook's Country is a nice magazine but it is one of those food magazines that takes the attitude of, "Everything you have ever eaten in your life has been crap." A recipe for slow-cooker Meatballs and Marinara begins: "The meatballs crumbled. The sauce lost its savor. A favorite dinner fell very short. Aren't slow cookers supposed to simplify things?" A dip recipe starts out: "When the solution (low-fat cottage cheese) turns into the problem (grainy texture), what then?" Aha, blueberry pie. The thing goes, "The crust split. Blueberries burned on the oven floor..."
"Why do steakhouse steaks taste so much better than those you grill at home?" "Does the phrase 'crispy baked French fries' have to be an oxymoron?" "Many brownies are raspberry in name only." For Poppy-Seed Coleslaw: "We wanted more from this sweet and sour classic than a sugar rush and seeds between our teeth." About Angel Food Cake, it warns: "If you don't sift the flour, separate the egg whites with tremendous care, and fold with a gentle touch, the majestic, snowy white cake turns out depressingly dense, squat and wet." For the love of God! Put a sock in it, you know? Most of what I cook and eat is pretty darn good. I don't know where these people have been all their lives that they have to begin all these recipes in this negative fashion. The Wall Street Journal did it this weekend too. "When was the last time you had a steak?" it asked. I am thinking, um, last week at E.B. Green's, listening to Jocko. Then it says, "The first bite was probably juicy and good." And I'm thinking, yes, it was. "But the next bite, your tongue was probably coated in grease." That steak was good all the way through! Maybe these people should come to Buffalo. Come-on-a-my-house as Rosemary Clooney used to say. I cooked for Leonard Pennario and I can cook for them too. There is a 'Betty Crocker' cookbook here that is from the 60s and it serves me very well. Being a bachelor, I usually only cook a limited number of dishes but have them down to a science, lol. Whenever I do try something new though, well, it would likely make the 'negative; column. At least the first time.